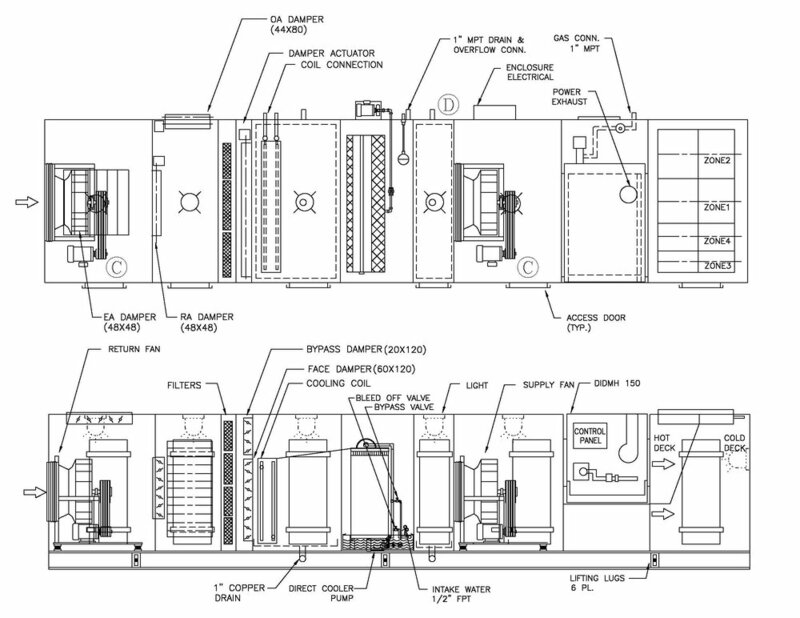 Air Handlers: HEAT RECOVERY/MULTI-ZONE — Westaire Engineering Inc.
Our custom- built, modular- construction air handling units represent a totally integrated system of air transfer. They are built for both indoor and outdoor installations. The completed units are constructed and tested at the factory, which accepts full responsibility for performance. All material and components utilized in the construction of Westaire air handling units conform to the requirements or standards of recognized technical or industrial organizations (i.e. ASME, UL and AMCA). Westaire air handling units comply with applicable requirements of Standard Heating and Cooling equipment (UL 1995/CSA C22.2 NO 236 second edition) and bear ETL seals. Capacity for standard units range from 2,000 to 30,000 CFM. Special units up to 140,000 CFM. 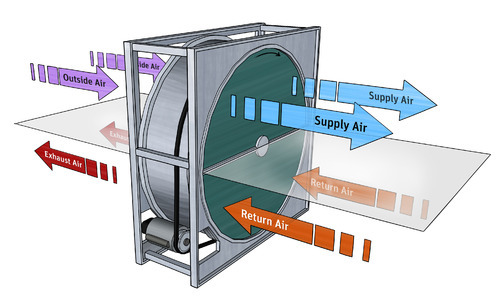 A heat-recovery unit re-uses the air from the building to warm or cool new fresh air. A typical unit features two fans, one to reuse the building air (Return Fan), and the other to bring in fresh air (Supply Fan). 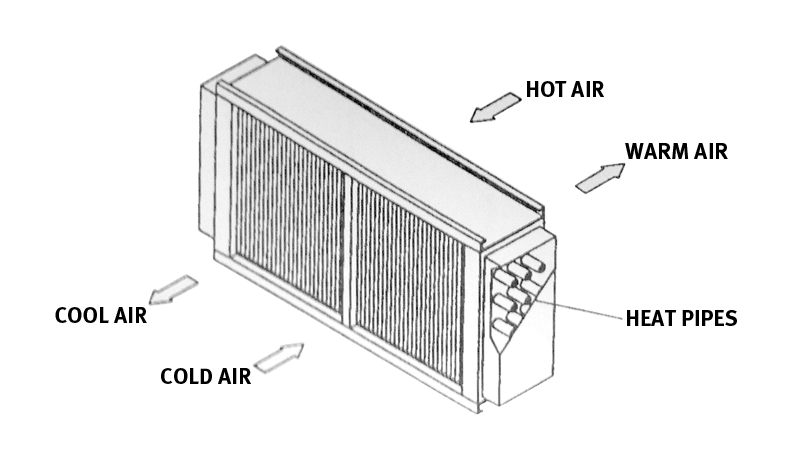 What makes a heat recovery unit unique is the heat-exchange core. The core transfers heat from the outgoing stream to the incoming stream in the same way that the radiator in your car transfers heat from the engine's coolant to the outside air. It's composed of a series of narrow alternating passages through which incoming and outgoing air streams flow. As the streams of air move through, heat is transferred from the warm side of each passage to the cold, while the airstreams never mix. Westaire can implement different types of heat-exchangers which best accommodate your air temperature requirements. Allows for a zoning system for your HVAC. In stead of having two or three units that are individually ducted to different areas of the building, our single multi-zone unit can fix this issue.We provide Double-Deck, and Triple-Deck Multi-zone units, which are designed with fully flexible features which allow different flows and different temperatures to different "zones" within the building. This is a way to control the temperature for each area, or "zone” in your building or warehouse, rather than having to heat or cool all the areas to the same temperatures. Our finished product presents an extremely efficient operation, which are controlled by low-leak zone dampers.